Today was Day #6 of Chocolate and Poetry Theme Week. 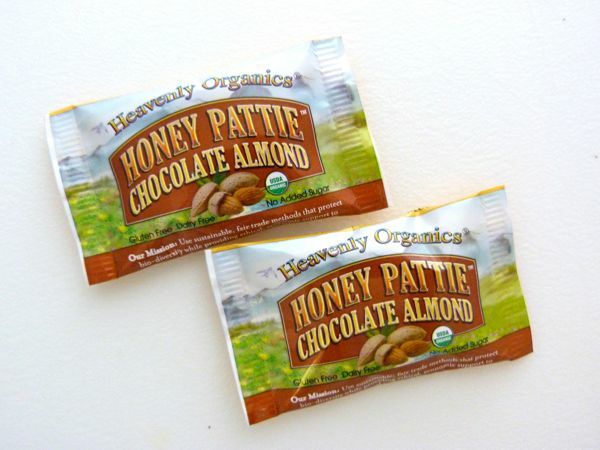 Heavenly Organics is a company that makes organic, sustainable, fairly traded chocolates. The company supports small farmers and indigenous forest dwellers in Central and Northern India, by buying honey from them. The company's Honey Pattie product line, uses 100% organic Italian, slow-roast, dark chocolate, and is gluten free, dairy free and is sweetened with raw, organic white honey, with no added sugar. Flavors include: Mint, Pomegranate, Ginger, and today's Almond. I carefully opened a wrapper that housed 1 small dark chocolate pattie. I've tasted many different combinations of chocolate, almonds and honey; and when I took a bite, I was half expecting chopped almonds inside. Surprise. 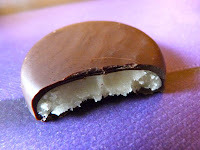 Instead, I bit into a lovely, creamy, smooth white center with a light almond marzipan flavor. Honey and flowers and almonds have inspired several serious poems about romance and good food for many centuries. However, my poet of choice today was British author, A.A. Milne, the voice behind Winnie the Pooh (also known as Pooh Bear), a stuffed bear that comes to life in the woods with his friend Piglet, and an assortment of other stuffed animal friends, and who loves eating honey from bees nests in the trees. Winnie the Pooh kept his treasured pot of honey, with the word "hunny" scrawled across it, in a special place. While some of Milne's poems and songs were silly, Pooh actually was a fount of wisdom. I've included a few Pooh quotes below. With apologies to A. A. Milne, I found it easy to replace Pooh's honey, or "hunny," with the word "chocolate" in a few places. "There there, said Piglet. "I'll bring you tea and honey, until you do." "'Well,' said Pooh, 'what I like best' -- and then he had to stop and think. Because although Eating Honey (Chocolate) was a very good thing to do, there was a moment just before you began to eat it which was better than when you were, but he didn't know what it was called." "Poetry and Hums aren't things which you get, they're things that get you. And all you can do is go where they can find you." I hope you all will be fortunate to be able to spend some time in the woods, a nearby park or a quiet patch, to relax and enjoy the scenery if you can.